We’d love your help. 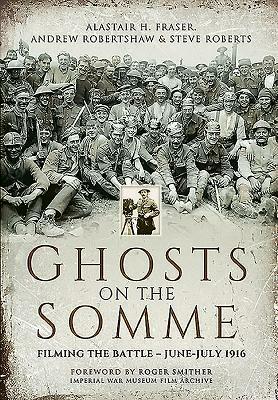 Let us know what’s wrong with this preview of Ghosts on the Somme by Alastair H. Fraser. To ask other readers questions about Ghosts on the Somme, please sign up. If you decide you want an in-depth look at the making of the 1916 blockbuster Battle of the Somme , this is the book for you. If not, the level of detail in the still-based analysis will go straight over your head. The illustrations do tell their own story, however. The technology may have had problems with clouds and movement, but not with the exhausted eyes of the wounded or the alternation of relief and shell-shock on the faces of Bavarian prisoners. A crouched corpse, the left had darkened w If you decide you want an in-depth look at the making of the 1916 blockbuster Battle of the Somme , this is the book for you. If not, the level of detail in the still-based analysis will go straight over your head. The illustrations do tell their own story, however. The technology may have had problems with clouds and movement, but not with the exhausted eyes of the wounded or the alternation of relief and shell-shock on the faces of Bavarian prisoners. A crouched corpse, the left had darkened with pooled blood, carries a pathos that even Michelangelo's Pieta cannot match. Time has not softened the impact upon the public. One widow [mis]identified her husband on-screen in October, a month after she'd received the KIA notice. One great-granddaughter almost saw her father or brother on-screen in 2011, who had inherited the mannerisms and smile of an ancestor that was to be dead within the hour. Reading miniature helmet lettering and reconstructing colours from grainy pictures where the untrained eye cannot go beyond "He has two eyes, a nose and a mouth" in combination with Then-and-Now battlefield archeology is a skill to envy. It serves to trace the bulky tripods of Geoffrey Malins and his lesser-known partner John McDowell (guess which one does not have his own Wikipedia page) in the week around 1 July 1916.